Meet your neighbors over: Apple-carrot muffins and cappuccinos at Gayle’s Bakery & Rosticceria, a happening breakfast nook. A stroll along the Esplanade’s “tile wall,” composed of hundreds of ceramic tiles painted by residents. A Zin at Cava Wine Bar. 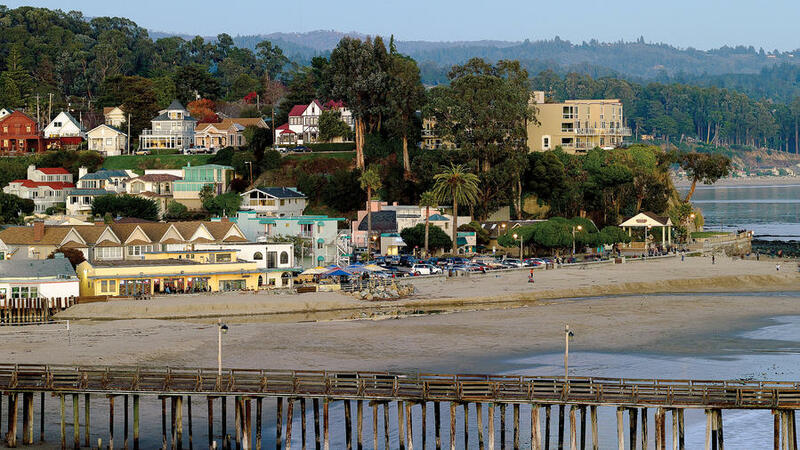 On Saturday: Take a plunge (surfboard optional) into the water at Capitola City Beach. Then explore Capitola’s cottage-lined back streets, maybe stopping at the historical museum. Dinner: Shadowbrook Restaurant, with a stellar wine list and its own funicular railroad. Yellow-slickered fishermen mix with just a sprinkling of iPad-toting tourists in this small riverfront town with San Francisco–steep streets. Particularly fine stretches of sand with towering dunes and uninterrupted ocean views make Astoria a dreamy spot…and then there’s the nostalgia. The young and hip love Astoria because it embraces the old and hip. Cozy up to the bar at Astoria Brewing Company’s sister taproom-cafe (wetdogcafe.com), or ride to dinner from the Cannery Pier Hotel (from $189; cannerypierhotel.com) in a chauffeured Packard. That’s right, it’s The Great Gatsby on the Columbia. An innovator in community planning, it’s a phenomenally scenic, historic fishing town where the Columbia River meets the Pacific. Two Del Martians experience paradise, Southern California–style: a sunny morning stroll on a blufftop overlooking the Pacific. It’s where the turf meets the surf ― a SoCal coastal town that’s maintained a distinct identity despite growth all around it. Of all the beautiful beaches on Kauai–and there are many–Hanalei Bay, near the North Shore’s Hanalei Town, may be the most captivating. Framed by green mountains and lined by ironwood trees, and punctuated by an Instagram-ready pier, the 2-mile-long crescent of soft, inviting sand hosts three beach parks (two with lifeguards); in winter, surf breaks are for experts, while summer brings placid waters that turn the bay into a big pool. Once you’re off the tourist track, it’s all about scenery, surfing, and multicultural cuisine: teriyaki, taco trucks, and chef Jim Moffat’s tuna carpaccio at Bar Acuda. A completely charming small town on the Kenai Peninsula that’s the artistic and literary epicenter of Alaska.